Paris, France. The city of love. Paris, city of love, is a beautiful and large city. One of the best ways to get an overview of the city is by visiting one of its many lovely viewpoints. From these viewpoints, you will be rewarded with bird’s eye views and panoramic vistas of some of the many world famous monuments and landmarks of Paris from towers, to parks, to buildings. This is a list of some of the best spots to view Paris, some well known, others not so much. When I think of Paris, the first thing that comes to my mind is the Eiffel Tower, one of the most popular and crowded attractions and viewpoints in the city. No trip to this magnificent city is complete without visiting one of the levels of the tower. From here, you will be rewarded with possibly the best views in the city. If you are visiting the tower, you will have two options: taking the lift or walking up the stairs. There are three lifts that will take you to the 377 foot (115 meter) second floor. These lifts are located at the north, east, and west pillars of the tower. Be prepared to wait in line for at least 30 minutes for the lift as most people would rather take the easy way up. If you want to visit the top of the tower at 905 feet (276 meters), you will have to change lifts on the second floor. Are you in shape? If you answered yes, then you can try to tackle the 704 steps up to the second floor of the tower. Not surprisingly, the line for the stairs is often smaller than the line for the lifts. My advice for the best experience, take the lift up and take the stairs down. Tickets can be purchased online at least two days in advance at http://ticket.toureiffel.fr/index-css5-sete-pg1-lgen.html. Otherwise you will have to wait in line to purchase tickets which can be a wait in itself. The Trocadéro at Palais de Chaillot, located on the banks of the Seine, is one of my favorite viewpoints in all of Paris. If you expect to have the place all to yourself, guess again. The viewpoint isn’t a secret as you can tell by all the other tourists, photographers, and vendors in the area. This was my first view of the Eiffel Tower when I visited Paris. Why you need to come here is for the postcard view of the Eiffel Tower, whether in the early morning, busy afternoons, or evenings when the lights become magical. Stand on the wide esplanade and take in the downright spectacular and iconic view of the Eiffel Tower and beyond. Feel the energy as you, and people from around the world, come together, laugh, marvel, and take photos of one of the most famous monuments in the world. For over 800 years, the Notre-Dame Cathedral has been one of the finest examples of Gothic architecture in the world. To reach the top of the 226 foot (69 meter) cathedral, you will have to climb 387 steps up a narrow spiral staircase. There is no elevator. As you climb higher and higher, level by level, you will be rewarded with better and better views. The climb might be tough for some, but it’s definitely worth the effort. During the climb, keep an eye out for the gigantic cathedral bell and the exquisite gargoyles. Once you reach the top of the tower, stop and enjoy the spectacular views of Paris. Keep and eye out for the Eiffel Tower and Basilica of the Sacré Cœur in the distance. Since the towers are popular with tourists, and narrow, only so many people can enter at a time. Arrive early, be prepared to wait, and be patient. The wait is worth it. Entrance to the towers costs €8.50 per ticket or free with the Paris Museum Pass. The Basilica of Sacré-Cœur, or Basilica of the Sacred Heart is by far my favorite spot in all of Paris. This must see tourist destination is one of the most beautiful buildings in the Paris. Entering the monument is amazing on its own. For a small fee, you can climb to the top of the 272 foot (83 meter) basilica dome for great views of the city. What makes the view so impressive is the location of the basilica on Montmartre Hill, one of the highest spots in Paris at 427 feet (130 meters). To reach the top, you will have to climb a narrow and claustrophobic staircase. Once you reach the top, enjoy the wonderful unobstructed 360 degree views of Paris from all directions. Entry into the basilica is free for all visitors. 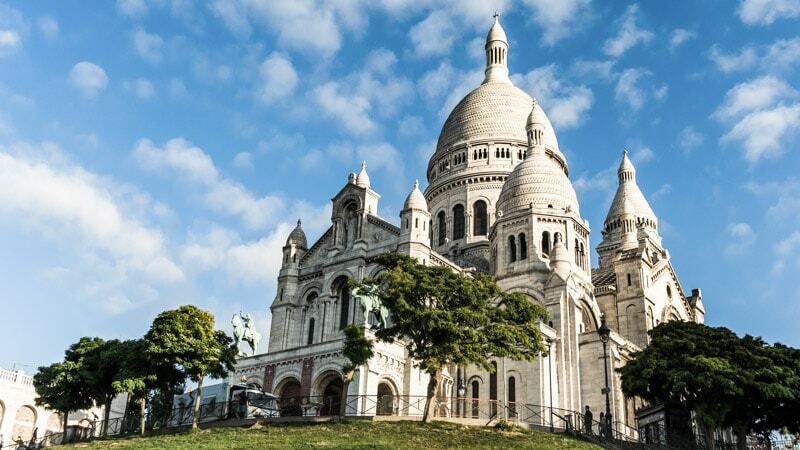 If you don’t want to pay to climb up the dome of the Basilica of Sacré-Cœur, then you can still get a stunning, and free panoramic view of the skyline of Paris from the top of Montmartre Hill. As mentioned before, the hill is one of the highest spots in Paris at 427 feet (130 meters), allowing for great views of the city below. In the 20th century, many well known artists worked in this location including Salvador Dalí, Pablo Picasso, and Vincent van Gogh. Montmartre Hill might be crowded with tourists, souvenir shops, overpriced restaurants, and shady street vendors trying to sell you stuff, but the hike up the hill is well worth the effort for the views and for Basilica of Sacré-Cœur. The Arc de Triomphe, located in a large roundabout at the end of Champs-Élysées, offers one of the more unique views of Paris. The view from the monument is not as high as that of the Eiffel Tower, but you will find less crowds which equals more room to enjoy the views from the top. From the top of the 164 foot (50 meter) monument, you have stunning views of the Paris skyline down twelve radiating avenues, most notably Avenue des Champs Élysées and Avenue de la Grande Armée. You also get a great view of the Eiffel Tower to the south. My favorite time to visit is at dusk when the city changes from light to dark. As with other monuments in Paris, you will have to climb a circular stairwell to reach the top. It’s 284 steps to reach the top, so be sure to wear some comfortable shoes. If you really do need it, there is a lift which takes you almost to the top, but I recommend using the stairs for the experience and the workout. If you choose not to go to the top of the arc, you can still get some great photos by simply walking around the arc. The different angles of the monument are fascinating. Beneath the arch lies the vault of the Tomb of the Unknown Soldier from World War I. Last admission is approximately 45 mins before closing. Closed on January 1, May 1, May 8 (morning), July 14 (morning), November 11 (morning) and December 25. If you have been to Paris before, then you probably have noticed that tall, out of place, and ugly building. That building is Tour Montparnasse, the tallest building in France from 1973 to 2011. The building might stick out like a sore thumb, but the view from the top is breathtaking. It is said that the view from the top is one of the best in the city because from the viewpoint, you can’t see the Tour Montparnasse. Most of the building is used for offices, but at the top, you can find two observation decks and a restaurant. If it’s a cold, hot, or windy day, then you might want to head up the lift to the indoor 56th floor observatory. From here, you can take in 360 degree views of Paris behind enclosed glass windows. The lift to reach the 56th floor only takes about 38 seconds, making it one of the fastest lifts in the world. For one of the best views of the city, head up to the awesome open air terrace at the very top of the building. At 656 feet (200 meters), the viewing platform is the highest in Paris. On a clear day, you can see up to 24 miles (60 kilometers) away. Braving the elements is worth the view. From the top you can see many Paris landmarks including the Eiffel Tower, Invalides, Sacré-Cœur, and Charles de Gaulle Airport. Tour Montparnasse is my favorite view in the city. If you can afford the expensive dinner, you can head over to the Le Ciel de Paris restaurant where you can eat and marvel at the wonderful views. Reservations only. Tickets can be purchased online by visiting http://billetterie.tourmontparnasse56.tickeasy.com/en-US/home. Most people visit Centre Pompidou for its modern art and exhibits showcasing artists including Jackson Pollock, Andy Warhol, and Pablo Picasso. The art is wonderful, but so is the view from the top of the museum on the 5th and 6th floors. As you ascend higher and higher on the elevators, you will be rewarded with views of the city. From the top floor, enjoy the incredible views of Paris without all the crazy crowds or slow moving lines. Look out for the Eiffel Tower and Sacré-Cœur in the distance. The ticket office closes at 8:00PM. Galeries Lafayette is a popular upscale French department store located in the 9th arrondissement of Paris. For a great, and free experience, head up to the rooftop terrace at the top of the department store for unobstructed views of the skyline of Paris with slightly less crowds than other viewpoints. To reach the rooftop terrace, I recommend taking the escalators over the lift, as the lift often stops at every floor. From the top, you can enjoy breathtaking views of the Eiffel Tower, Louvre, Opera House, and Sacré-Cœur. The Saint-Jacques Tower is an elaborate Gothic tower and monument located in the 4th arrondissement of Pairs. The tower is all that remains of the 16th-century Church of Saint-Jacques-de-la-Boucherie (Saint James of the butchery). The church was destroyed during the French Revolution in 1797. Today, the tower is considered a national historic landmark. If you want to climb the claustrophobic circular stairway to the top of the tower, you will have to join a guided tour that is only available on Fridays, Saturdays, and Sundays between June and September. Tour sizes are limited and reservations must be made. Another thing to mention is that all guided tours are done only in French, so make sure to grab an English pamphlet at the start of the tour. Some guides might answer a few questions in English, but come expecting only French. Once you reach the top of the tower, you can enjoy some of the best view across Paris. In my opinion, the views from the top are better and more intimate than those found at the top of the Eiffel Tower and Notre-Dame Cathedral. Access to the tower is by guided tour only. The tour takes about 50 minutes with about 15 minutes at the top. Reservations are required and can be made online at http://www.desmotsetdesarts.com/cart_items (French) or at the tower on the same day of the tour. Guided tours occur on the hour between 10:00AM and 5:00PM every Friday, Saturday, and Sunday from June to September. At 354 feet (108 meters), Parc de Belleville is the highest park in the capital of France. It is located in the 20th arrondissement in the Belleville neighborhood between Parc des Buttes-Chaumont and Père Lachaise Cemetery. On warm sunny days, you will often find many Parisians having a picnic on the lawn and enjoying life. Head up the stairs to the terrace at the summit of the park to check out panoramic views of the skyline of the city with Tour Montparnasse and Eiffel Tower visible. The view from the top reminded me of Montmartre but without all the crowds. In Suresnes, a suburb west of Paris, is Mont-Valérien. It was here where Fort Mont-Valérien defended Paris during the Franco-Prussian War (1870-1871). During World War II, over 1,000 prisoners and members of the French Resistance were executed here. From the terrace of the fort, at 531 feet (162 meters), visitors can take in sweeping vistas of the city along with views of landmarks such as La Défense, Eiffel Tower, Tour Montparnasse, and the Panthéon. You also get a great view of Bois de Boulogne park at the bottom of the hill. Parc de Saint-Cloud, which is actually located west of central Paris in Hauts-de-Seine department, is considered to be one of the most beautiful gardens in Europe. The park covers 1,136 acres (460 hectares). During the 16th century, a royal residence known as Château de Saint-Cloud was located here. The structure was razed in 1892. The best part about the park are the panoramic views of Paris and its suburbs across the Seine. The view actually has a name, known as “La Lanterne” or the “Lantern of Demosthenes.” From here you can see landmarks such as the Eiffel Tower and Tour Montparnasse.